SUNRISE, Fla. (AP) — The Florida Panthers have set some individual records this season. In the end, though, it was the same old story. 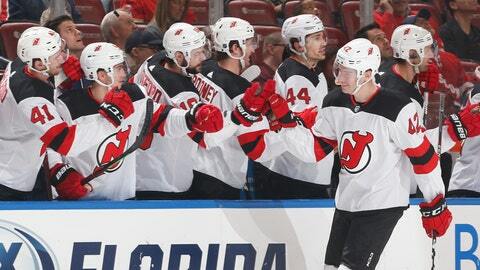 Travis Zajac scored the winning goal on the power play in overtime, lifting the New Jersey Devils to a 4-3 victory over the Panthers on Saturday night. Nathan Bastian scored twice in regulation, Pavel Zacha also scored a goal and Mackenzie Blackwood stopped 37 shots for the Devils in the season finale for both teams. Aleksander Barkov set a Florida franchise points record with a goal and an assist, Jonathan Huberdeau scored his career-high 30th goal of the season and Mike Hoffman also scored a goal for the Panthers — his 300th NHL point. Roberto Luongo made 23 saves. The Panthers missed the playoffs for the third straight season and haven’t won a playoff series since 1996. On the winner, Zajac fired a shot from the high slot that got past Luongo at 4:04 of 4-on-3 overtime. “That was the longest game, I feel like, to end a season. But it was good,” Zajac said. Barkov’s goal, his 35th of the season, was his 95th point, surpassing Pavel Bure as the Panthers’ single-season leader. Barkov also had an assist. The Panthers have three 30-goal scorers (Hoffman, Barkov and Huberdeau) for the first time in franchise history. Trailing 3-1, the Panthers scored two goals in the final 3:25 to tie the score at 3. Huberdeau closed the gap to 3-2 when Evgenii Dadonov passed from behind the net to Huberdeau in front, and Huberdeau poked in the puck for his 30th goal. Hoffman tied it at 3 on his shot from the high slot that beat Blackwood with 1:25 left in the third. Trailing 2-0, Barkov skated in and fired the puck under Blackwood’s pads with 8:02 left in the second to make the score 2-1. The Devils took a 3-1 lead when Zacha easily got past defenseman Aaron Ekblad and flipped the puck into the net with 5:31 left in the second. Bastian opened the scoring on his first goal at 1:27 in when his one-timer beat Luongo on the glove side. Bastian stretched the lead to 2-0 when Egor Yakovlev made a nice centering feed and Bastian redirected the puck into the net at 7:41 of the second. The Devils had a goal overturned when Drew Stafford was called for a high stick after he deflected a shot by Kenny Agostino into the net in the first period. NOTES: Panthers F Jamie McGinn and C Denis Malgin each played Saturday. McGinn was a healthy scratch the past four games, and Malgin the past two. … Devils forward Brett Seney played his first game since Feb. 23 after being recalled from AHL Binghamton. … Zacha celebrated his 22nd birthday Saturday. Both the Devils and Panthers head into the offseason after failing to make the playoffs.